Our Story - Pure Island Beef Co. Exceptional taste. Carefully raised. Dry-aged. Hormone-free. These are some of the things that set Pure Island Beef apart. Some, but not all . 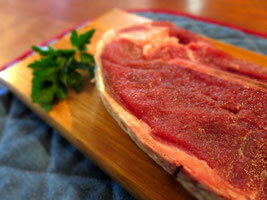 . .
One of our dry-aged, grass-fed T-bone steaks ready for the grill. 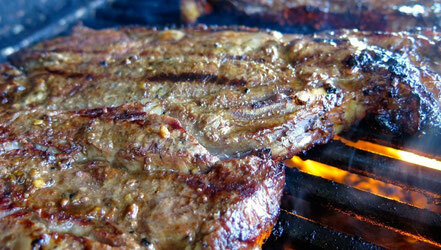 All our grass-beef is aged 30 days for extra tenderness and taste. Our extreme-aged beef is dry-aged for a full 60 days before cutting and wrapping. 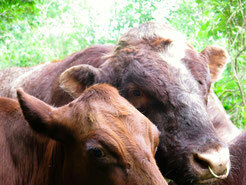 The stylish bull with the ring in his nose is Gus, one of our award-winning Shorthorn bulls. The Shorthorn breed comes originally from Britain, and delivers exceptionally tasty beef that ages well. 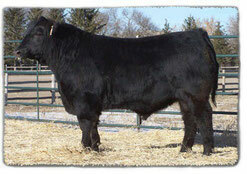 This is Prime Cut 741S, one of our best Angus bulls. He was born in 2006 and has been a mainstay of our breeding program. Back in 1978, we began a decades-long breeding program to create exceptionally tender and flavourful grass-fed beef. Our herd includes Shorthorn and Black Angus cattle bred especially for flavour, tenderness, marbling and aging qualities. This puts us out of step with the way things are usually done in the beef business, but that’s okay. We believe that beef should be judged at the dinner table, not the weigh scales. No beef ever reaches its full potential for flavour or tenderness without at least 30 days of dry aging. But you need to intentionally raise cattle so beef can be aged this long. And to be honest, not all the animals we raise end up with full aging potential. That’s why only the best of the best carries the Pure Island name. One of our T-bone steaks ready to come off the grill and onto the table. Dry aging, a controlled balance between fat and lean, and intentional breeding makes our beef exceptionally good. All Pure Island cattle spend as much time as possible grazing on Manitoulin Island pastures. 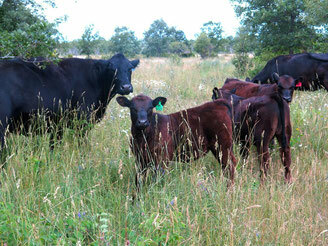 The blend of wild and domestic plants on pasture makes for healthy and happy cattle. All our cattle are carefully raised free of artificial hormones and without antibiotic feeds. We also do everything we can to ensure our animals are comfortable year-round and free to range on pasture whenever it’s available during the grazing season. It’s more trouble this way, but that’s just the way we do things. Our farm is always open for visits, too. Come and see for yourself. If you've never experienced Manitoulin, it's well worth the trip. The Island is not like any other farming area in Ontario. It's a surprising mix of farmland, forest, over 100 inland lakes right on the island itself, with limestone bedrock poking there here and there. Cattle breeding is just as important as cattle feeding when it comes to beef quality. 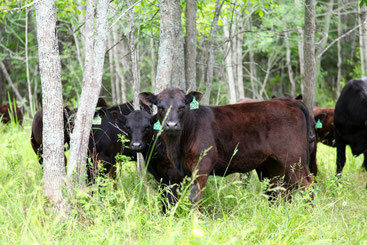 Here a group of Angus cattle are on one of several pastures we have. Only the best of the British breeds we raise meet our Pure Island standards. Farming is an art as well as a science, and all the beef that carries our name has been individually assessed and approved as meeting our taste and quality standards. In fact, we continually taste-test samples from our beef to make sure it meets our standards. What else can we do when we stake our reputation on your full enjoyment of Pure Island beef? Whatever you do, don't take our word for it. Pure Island beef has a special place in the fanciest butcher shops of Toronto. Click to read what our customers have to say.